SINGAPORE could be an enlightening example for multi-ethnic countries around the world that struggle with conflict, discrimination, oppression of minorities, or even war. The tiny city-state, an island country located off the southern tip of mainland Malaysia and north of Indonesia, has a highly mixed population that includes Chinese, Malay, Indians, and so-called “Eurasians,” people descended from Europeans who intermarried with local Asians. While Singapore has not always had such a diverse population, it became dominated by immigrants from China, Malaysia, and India soon following the British annexation of the island in the 19th century. These groups, following religions that range from Buddhism to Hinduism and from Christianity to Islam, coexist peacefully. A recent analysis by the Pew Research Center found Singapore to be the world’s most religiously diverse nation. Walking around in the city, one should not be surprised to find a Buddhist temple on Mosque Street, or a church right next to Arab Street. Census estimate nearly 15 percent of the population in Singapore are Muslims, but despite this relatively small percentage halal restaurants can be found nearly anywhere, making the country an attractive destination for Muslim travelers from around the world. The area around Sultan Mosque – Singapore’s largest mosque with an impressive golden dome – is a hub full of Middle Eastern restaurants and cafés. The mosque, first built in 1824 for Singapore’s Sultan Hussian Shah, forms the heart of the Arab Quarter, commonly referred to as “Arab Street,” the neighborhood’s most commercial street. Other streets also carry names from the Arab and Muslim world, including Haji Lane and Muscat Street. Apart from restaurants and cafés that attract a large number of visitors looking for a place to relax and smoke shisha in the evening, the area is popular for its colorful fabric and Persian carpet stores as well as alternative boutiques. Halal food outlets and restaurants are by no means restricted to the Arab Quarter. They pop up all over the town, from the restaurants in famous luxurious hotel chains to hawker centers that sell a variety of inexpensive food. One of the most popular dining venues for Muslim locals and travelers is Straits Kitchen, a halal restaurant inside Grand Hyatt hotel Singapore. Since its opening nearly a decade ago, this restaurant has been designed and created to include a Halal-certified kitchen. What makes it unique, though, is that it provides a comprehensive overview of Singaporean street food — a combination of ethnic Chinese, Malay, and Indian dishes — in the comfort of a luxurious restaurant. Prior to the opening of Straits Kitchen, it was hard for Muslims to find halal Chinese food in Singapore, which often contains various non-halal ingredients and condiments, from non-ritually slaughtered beef and chicken to pork, lard and alcohol. The first halal-certified local cuisine buffet restaurant serves its guests in a market place setting. Another popular five-star hotel located in the heart of the city, Fairmont Singapore has no less than 14 restaurants and cafes inside its premises, and a popular venue featuring local and regional foods is Asian Market Café. With a similar set-up as Straits Kitchen, this halal-certified restaurant not only offers Singaporean delicacies but “pan-Asian cuisine,” as stated on the website. As such, do not be surprised to find Chinese noodle soup next to Japanese sushi, and Indian curries side by side with Indonesian satay. 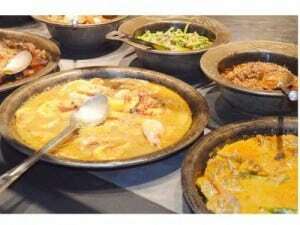 However, halal food is not limited to five-star hotels alone. In Singapore, halal certification is taken care of by the Majlis Ugama Islam Singapura (Islamic Religious Council of Singapore), abbreviated as MUIS. All establishments that claim to sell halal food need to be able to show customers their MUIS Halal Certificate. An increasing number of food stalls on the street and in hawker centers – open air complexes that house large numbers of food stalls selling inexpensive food — decide to apply for the certification to cater to Muslim customers as well. Usually, their certificate is visible for anyone to see. He added that halal food is available at Universal Studios and the Adventure Cove Waterpark, as these parks not only target locals but also tourists from Malaysia and Indonesia, two major Muslim countries. Singapore has not always been the Utopia it is today. When the British left the island in 1963 the country decided to join the Malaysian federation mainly because of concerns regarding the scarcity of land, water, markets and natural resources. The marriage proved unsuccessful due to concerns about Singapore’s ethnic Chinese population and economic clout, and two years later Singapore was expelled from the federation. In the 50 years that have passed since then, Singapore successfully transformed itself into a hub for electronics manufacturing and financial services, making it one of the wealthiest states worldwide.